With Spring springing everywhere and beautiful, fresh new vegetables available in a colorful array at Farmer's Markets in many parts of the world, I thought I would present a decadent sauce to go with those vegetables. The so called mother sauces of French cuisine. It's called the "mother" of sauces simply because it is often used as a basis from which other sauces are derived. 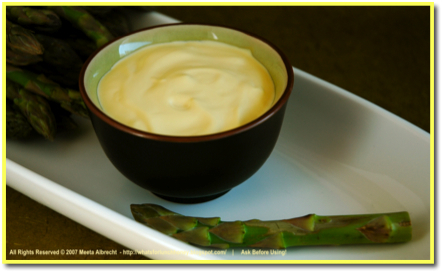 I am talking about the rich, creamy and luxurious sauce Hollandaise. After tackling the Chocolate Crepe Cake I need to carry my nerves further to the edge and dared to make a sauce that will not accept if you step out of line with it - do and watch it backfire on you. This sauce needs love, caressing and non-stop whisking for it to reward you with it's decadent delicious taste. I'd like to send this one to the ever so lovely Barbara of Winos and Foodies. She created an event that really touched my heart and once again showed me how we food bloggers stick together through thick and thin, wok and pan, asparagus and zucchini! Barbara, whose life has been effected by cancer and is battling it with a respect and boldness that makes me feel so very humble in comparison. Her wonderful event A Taste of Yellow calls upon all of us Bloggers to contribute a yellow dish to show our support for Lance Armstrong's Foundation Livestrong. I have had no experience with cancer and no one close to me has been effected by it. Does this make me ignorant to it? No, because I would like to show my support and help those who are. Some run a marathon to show their support, I as a Foodie would like to show my support by blogging about it and raising awareness for Barbara's efforts. You'll find an incredible 148 entries in the A Taste of Yellow roundup. Hollandaise means Holland-style. The sauce is made by continuously whisking and heating egg yolks, lemon juice, and some water, then slowly blending in butter until a creamy and rich sauce is produced. Seasoned, it pairs perfectly with vegetables the best, but also eggs, meat and fish. Many historians agree that the original recipe for the sauce actually originated in Normandy, France. A place well-known for its butter and use of butter in cooking. It was first known as Sauce Isigny, after the town of Isigny in Normandy. The recipe can be found in recipe books dating from the 1800s. One theory for the renaming to sauce Hollandaise seems to be that during the first World War, little butter was produced in France and had to be imported from Holland. The name was changed to hollandaise to indicate the source of the butter and was never changed back. As always my recipe has a slightly different twist to it. I add a few finely chopped shallots and green peppercorns. Other methods of preparing sauce Hollandaise. If you like my photographs, stories and recipes, please take a moment to vote for me in the category you see fit. Vote here. Thanks for your support! You will need a double boiler or prepare your own water bath for this. Select a metal bowl and a pot in which the metal bowl can rest firmly on. Fill the pot with enough water so that it does not touch the metal bowl when it is placed on top of it. The water needs to be heated to 60-70 degrees Celsius - not more or else you'll get scrambled eggs. At a low heat melt the butter in a pot, making sure not to brown. Take the pot off the and allow the butter to cool slightly. In a separate pot cook vinegar, 2 tablespoons water, peppercorns and shallots for a few minutes. Do not brown. Sieve through a fine meshed sieve into the metal bowl. Add the yolks and an additional 1 tablespoon of water. Whisk together to combine. Place the metal bowl on your heated water bath and whisk continuously and vigorously for a few minutes until a thick and creamy texture is produced. Using an electric blender for this is NOT a good idea and you really have to rely on old fashioned elbow grease for the best results. Remove from water bath and keep beating for another half a minute. Drop by drop add the butter to the egg mixture beating continuously. Eventually add the butter in a steady stream to the tempered egg mixture, whisking all the time. Add lemon juice and season with salt and pepper. Serve immediately and warm - not hot. If the sauce is not served immediately it becomes firm as it starts to cool. The melted butter and the egg yolk cream need to have the same temperature, otherwise it will coagulate. Should this happen add some cold water - drop wise - into the mixture, gently whisking it. As Hollandaise is an emulsified sauce it is vital to maintain the emulsion. This means the blending of oil or another form of fat and a water based liquid, where tiny droplets of the one are dispersed in the other. But fat and water do not mix and once they are brought together they exert a lot of energy to revert back into their original components by separating. If they do the sauce has then "broken." To avoid this you have to make sure that you add water, the butter is added gradually, there is limited heat and non-stop whisking. Using clarified or whole butter depends on the texture and taste of the sauce you would like to have. Clarified butter will get you a thicker and richer sauce than whole butter because it contains pure butterfat. Whole butter has a certain percentage of water in it, which will give you a thinner sauce. However, the water in whole butter helps to optimize the emulsification and as it also contains milk solids, it will give your sauce more flavor. If you do want to use clarified butter you will need to compensate with more water at the beginning of the instructions when the eggs are mixed in. Smooth, creamy, silky and just slightly tart. During this time of year we are forever eating a variety of fresh vegetables, cooked quickly by either roasting or steaming. Sometimes we just like to be a bit decadent and indulge in this rich creamy sauce. Poured over vegetables like asparagus, broccoli, cauliflower or artichokes, dinner time becomes so Oh! la la! OK, it is not kind to the waistline but hey once in a while we need a sin or two right? Next week I'll show you how I used this Hollandaise in my own recipe for the MM event Spring Is In The Air. Yummy! Makes me think of eggs benedict - maybe I'll make brunch on Sunday!! Thank you Meeta for your entry and your kind words. My husband loves Hollandaise and I've only ever made it once. Your recipe is bookmarked to try. I love the addition of the shallots in your recipe! 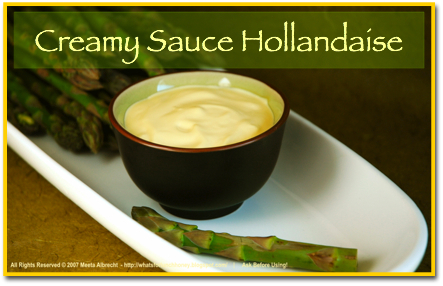 For some reason, Hollandaise is the perfect spring sauce, probably because it goes so well with asparagus. I rarely make hollandaise (or the orange version, maltaise) anymore, so when I have it, it's a huge treat. 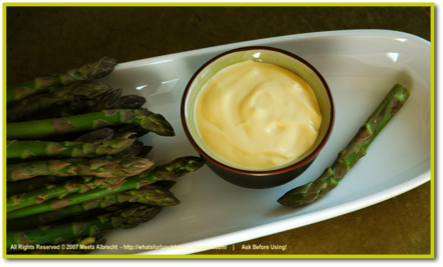 What better than fresh asparagus dipped in hollandaise? Sounds like heaven! Ah yes, the mother sauce. I've never tried making it myself but will bookmark your recipe to try it. Meeta, thank you!! U are a mind reader, Siv and I've been talking about making eggs benedict for a few weekends now, I wasn't brave enough to try making the hollandaise from scratch, but now with your instructions I'm gonna try. Thanks sweety, and have a great weekend! I like your recipe better than mine- I've added the butter cold - in pieces - and waited for it to melt, all the while whisking away. I didn't use water either. Now I'm going to switch to your version - and I"m sure it will be much better! Eggs Benedict for Sunday! We love hollandaise sauce here but your recipe is a little different than mine. I'll have to give it a try! Delicious! Meeta, that is one smooth looking hollandaise! And what a perfect pretty lemon colour too. Hi Meeta! Your hollandaise sounds amazing... I love it in eggs benedict, and I bet it's fantastic with that delicious fresh asparagus! Thanks for the recipe! Great post! I love Hollandaise on asparagus...always brings me back to childhood! I've never attempted hollandaise even though I love it and eat it every other week for brunch over eggs benedict. Thanks for demystifying the process for me. Never knew the use of clarified butter made such a difference. thanks for highlighting this event, meeta. the deadline is a couple days away, but we'll contribute something. your sauce looks great. Wow that is a total tutorial on hollandaise! Excellent! Can you see how far I've fallen behind in my reading here. Deborah, Oh yes, a classic!! Barbara, Glad I was able to take part. Hope you'll let me know how he liked it. HT - Exactly - hollandaise and asparagus are the perfect pair. The shallots gives the whole sauce a brilliant flavoring! Lydia - once you get a routine to doing it you can really whip it up quickly. But even then it is a treat!! Cynthia, Hope you find it easy and you like my version. Sig, you have to come back and let me know how it was. Cyndi - it's a little trick I learned while training at the Sheraton! But it works well. Hope you have a great brunch! Kristen - hope you like it! Gilly, you welcome and thank you! Helene, Although it goes so well with asparagus I also find it works great on cauliflower. It is such a boring vegie otherwise LOL! Lori, that is the purpose of this Cooking School series. Recipes that everyone really loves but is scared to try out. I hope I was able to take away some of your fears and you will give it a go. Bee, glad you can make it. Sushma - yes with fish it is great too. Tanna - you are making it up though! !